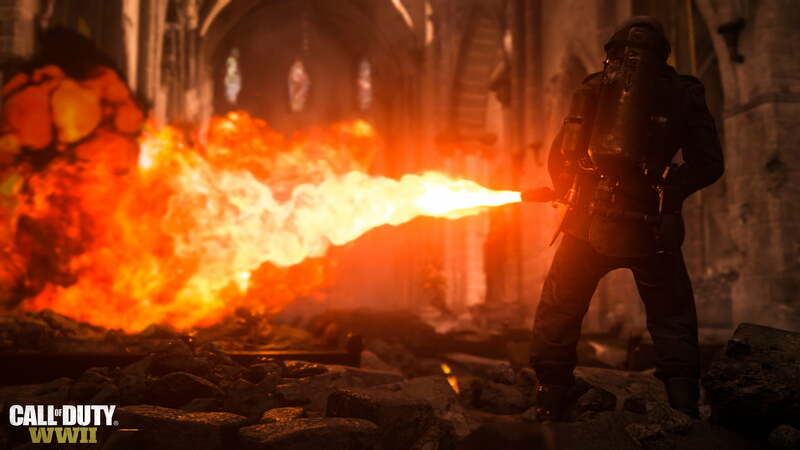 On April 26, Sledgehammer Games and Activision pulled back the curtain on the 2017 entry of the Call of Duty franchise, Call of Duty: WWII. After years of increasingly futuristic first-person shooters, the new Call of Duty will return to the gritty, horrifying European theater of World War II, with a story that focuses on the comradery between fellow soldiers and the tragic loss of life that took place between 1944 and 1945. The team has reportedly gone to great lengths to make the experience feel as true-to-life as possible, and create a respectful version of World War II: One that allows you to experience battles without devolving into sugarcoating their consequences. Sledgehammer’s serious and bleak depiction of World War II features a single, stark outlier: The return of the franchise’s fan-favorite “zombies” co-op mode, set in an alternate timeline where Hitler attempts to create an undead army in a desperate attempt to win the war. While a Nazi-themed zombies mode could make for an entertaining thrill ride, harkening back to classic B-movies, it has absolutely no place in a game that is otherwise taking war so seriously. Zombies has absolutely no place in a game otherwise taking war this seriously. Zombies mode was originally introduced as an Easter egg in 2008’s Call of Duty: World at War. Not advertised or discussed prior to the game’s launch, it began after completing the last mission of the game, acting as a small aside that was not, and shouldn’t have been, the main focus of a game dealing with an actual conflict – one that cost millions of people their lives. This wasn’t the case with zombies’ announcement in Call of Duty: WWII. After the game’s cast described the campaign as emotionally powerful, suggesting it could tell a more touching story than we’ve seen in other war games, the mood shifted the moment the conversation turned to the game’s generally tongue-in-cheek zombies mode. Sledgehammer Games’ staff instantly lightened up, making jokes about how fun players will have killing undead Nazis. The abrupt shift from describing war as “living hell,” and suggesting that games like this exist so new generations can understand what their ancestors went through, to a game that treats war as “fun” not only feels tone-deaf, but dishonest. The campaign, which many players tackle first with a new Call of Duty game, sets the game’s tone and gives us a feel for the new installment’s unique features. Pairing a game that has such an affective tone with something lighter detracts from its intended message. The early Call of Duty games, which serve as an obvious source of inspiration for WWII, drove home an anti-war message countless times throughout their campaigns. After dying, the “game over” screen would display a message detailing how many people lost their lives during a conflict or the cost of the weaponry used to kill instead of helping those in need. Though small, these statements helped to remind players that, while you may get a sense of satisfaction from killing Nazis, these games were inspired by real events, which had real consequences. The soldiers who survived the war couldn’t just turn off their game consoles. It stuck with them forever. A scenario where an insane Hitler brings the dead back to life seems to imply that history wasn’t intense enough. With the word “horror” used by Sledgehammer during the announcement stream, it would appear that zombies mode will be less comedic than the last few zombies campaign, functioning more as an intense “what if?” thrill ride. Even without the jokes, though, the fantasy element downplays the overarching message the game will reportedly seek to establish. Adding a scenario where an insane Hitler brings the dead back to life seems to imply that history wasn’t intense enough. Watching soldiers collapse under MG42 fire – and knowing that actual people lost their lives – is emotional and impactful in its own right. That isn’t to say that there isn’t room for a WWII-themed Call of Duty “zombies” campaign. If it were spun off as its own game, removed from the authentic, austere campaign, it might make more sense in own right. Its ridiculousness could serve its purpose without detracting from Sledgehammer’s historically authentic campaign. It would instead be treated as something else entirely – escapism meant to represent only the creativity of its designers. Call of Duty: WWII can’t be taken seriously if it juxtaposes its most important content with something so intentionally unimportant. If we wish to hold war games wish in the same regard as films such as Saving Private Ryan or The Thin Red Line, we must all come to terms with that.